Findings from a new large-scale consumer study conducted by Market Force Information® (Market Force) reveal that Nordstrom is the nation’s favorite fashion retailer for the fourth consecutive year. Marshalls ranked second, H&M and Ross Dress for Less tied for third, Kohl’s was fourth and Macy’s was fifth. More than 5,700 consumers were polled for the study, which revealed consumers’ fashion shopping habits, brand preferences and engagement, issue resolution and social media usage. The research highlighted opportunities for brands to deliver better experiences to consumers, with one in five indicating they were dissatisfied with their fashion retail experience. For the rankings, Market Force asked participants to rate their satisfaction with their most recent fashion retailer experience, and their likelihood to refer that retailer to others. The results were averaged to attain a Composite Loyalty Score [See Graph 1]. Nordstrom, known for delivering exceptional customer service, ranked first among the retailers studied with a score of 58%, an 8% drop from its 2015 score. Meanwhile, discount chains such as Marshalls made big gains, moving from seventh place last year to second place this year with a score of 53%. H&M and Ross Dress for Less also landed in the top five after not making the cut last year. Kohl’s, Macy’s, T.J. Maxx and Dillard’s all dropped a few spots from the previous year’s study. Market Force wanted to understand how satisfied consumers are with their fashion retail experiences. The company identified seven key areas that drive customer satisfaction and asked respondents to rate the fashion retail brands in those areas: Merchandise selection, value, store atmosphere, ability to create an outfit, checkout speed, ease of finding items and size selection. Nearly one-third of shoppers surveyed indicated that the fashion retailer they most recently visited performed poorly in all seven categories. Nordstrom came out on top for store atmosphere, size selection and checkout speed. H&M performed well across the board, ranking highest for merchandise selection, ability to create an outfit and ease of finding items. Marshalls and Old Navy were cited for having the best value [See Graph 2]. Although 84% of shoppers reported making a purchase during their most recent visit to a fashion retailer, Market Force found that less than half were assisted by a salesperson during that shopping trip. This lack of engagement could be hurting retailers’ chances to build satisfaction and generate sales. In fact, two-thirds of those who failed to make a purchase indicated that they were not assisted by a sales associate, demonstrating missed opportunities to drive conversion rates. 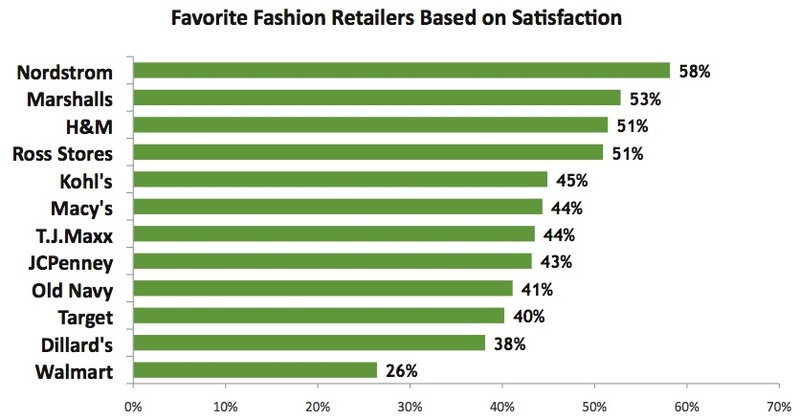 Of the fashion retail brands studied, Nordstrom’s sales associates assisted customers the most and they received the highest satisfaction scores. [See Graph 3]. When it comes to use of mobile apps and social media relevant to fashion, Market Force found that 20% of those surveyed have used technology (i.e. blog, website, mobile app) to share their personal styles or to learn about fashion. Pinterest was by far the most popular social network for sharing fashion inspiration, with 67% saying they used it. 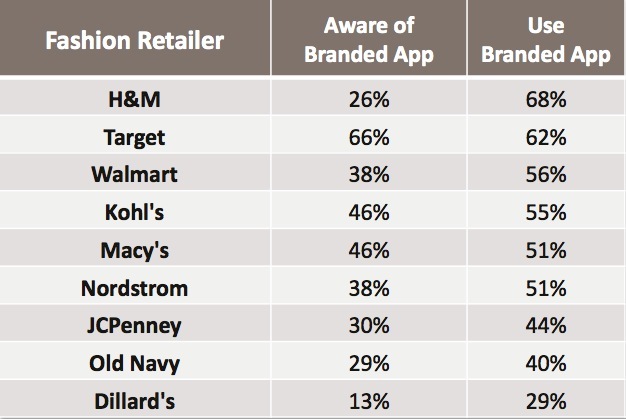 H&M’s mobile app is the most used out of the top retailers studied, despite having low awareness rates. Sixty eight percent indicated they have used H&M’s mobile app, while 62% had used Target’s, and 56% had used Walmart’s. Target had by far the highest awareness of its app, with 66% indicating they knew of its existence. 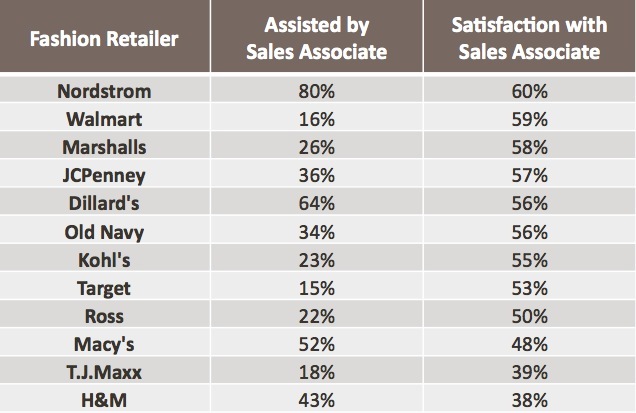 Kohl’s and Macy’s tied for second in app awareness. [See Graph 4]. The survey was conducted online in December 2015 across the United States. The pool of 5,722 respondents represented a cross-section of the four U.S. census regions, and reflected a broad spectrum of income levels, with 67% reporting household incomes of more than $50,000 a year. Respondents’ ages ranged from 19 to over 65. Approximately 57% were women and 44% were men. Follow Market Force’s Fashion Retail Insights page on LinkedIn for the latest insights, timely discussions, commentary and industry news.